post makes the case to include the Stratus Red 2008 in the elite category as the cool wet 2008 season forced Groulx to coax every old vine sinew to extract as much as physically possible from the Niagara Lakeshore sub appellation terroir. The 2008 vintage is unarguably more austere than the 2007, yet any wine enthusiast will be hard pressed to find another New World assemblage that has the flavour profile of an Old World Meritage reminiscent of Bordeaux’s Left Bank. 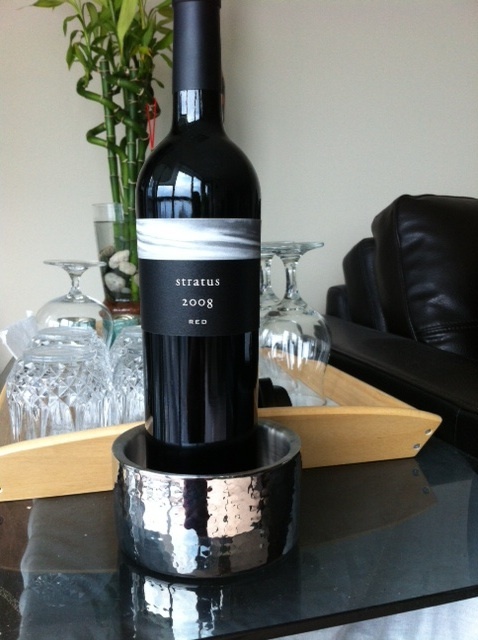 But unlike Bordeaux’s great vintages that shut down years after bottling – think of the 2005 as an example since that year’s trophy wines are not yet close to drinking today – the 2008 can be drunk today with decanting to soften the tannic backbone of Cabernet Franc, Cabernet Sauvignon and Merlot combined with a splash of Petit Verdot. Notwithstanding the ready-to-drink element of the 2008 vintage patient collectors will be rewarded by cellaring till 2020.
this assemblage is a worthy competitor to every wine critics’ favourite Canadian red -- Osoyoos Larose Le Grand Vin – and weighs in at less than half the price (44.20 at the LCBO Vintages 131037). 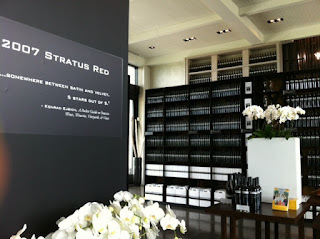 Stratus clearly positions itself to be a premium vineyard: the fluidity and polish of Diego Burdi’s design that is more akin to luxury condominium welcomes those visiting the vineyard, as does outstanding stemware from world leaders Spiegelau, Ravenscroft and Riedel. However the label designs are consistent and safe, rather than inspiring, and the stingy pricing of its sampling structure at the winery -- $10 for 3 one ounce flights whose priced is waived with six bottles -- may deter the budget savvy budding oenophile. 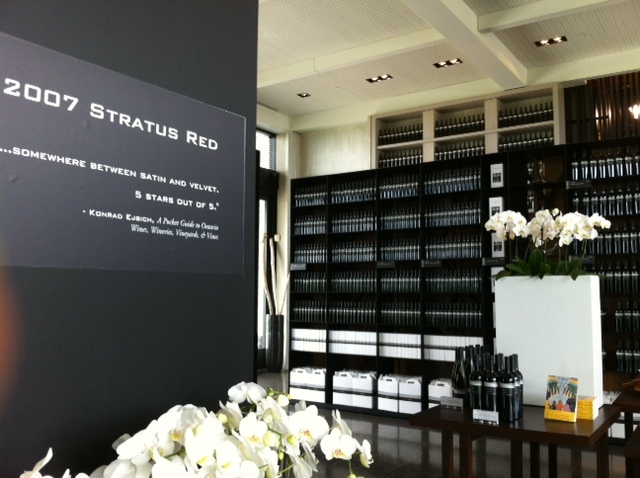 The real secret to Stratus’ success, past, present and future, will be the dedicated craftsmanship of master winemaker J-L Groulx and his ability to weave old world techniques with modern partnerships, sustainable practices and an open mind.